Gather with fellow Sooner fans around your University of Oklahoma Fire Pit. 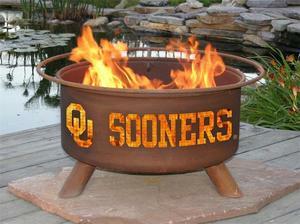 Alumni, students, college hoops and football fans will love our line of Collegiate Fire Pits. Each pit comes with a poker, a spark screen and a BBQ grill. These unique fire pits are a must for tailgate parties and grilling before the big game. Manufactured with pride by Patina Products, show your school spirit by ordering one today. • Natural rust patina finish ages beautifully over time. • Safety ring surrounding fire pit also functions as a footrest and handle. • Manufactured from cold-rolled steel for years of durability. • Sturdy legs are welded in place to prevent pit from wobbling. • Comes fully assembled for immediate use. • Five-year warranty: Fire pits guaranteed not to burn through or rust through for five years. • This Fire Pit is designed in the United States to the highest standards of craftsmanship. It is built to last using materials that have been selected to weather changes in temperature, moisture, and other challenging outdoor conditions. • Logos and images are cut into the sides of our fire pits using a CNC (Computer Numeric Control) Plasma Cutter and the finished product is 100% hand-welded and hand-finished. As such, slight variations in patina finish, as well as resolution and detail of customer supplied and/or custom logos are normal, and may vary due to the nature of our manufacturing process. Variations include, but are not limited to patina (rust) finish, logo or image placement, quality (thickness, resolution) of line art, cut and weld penetration and uniformity.